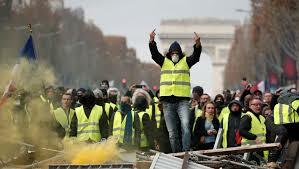 CENTRAL PLANNERS WORLDWIDE WERE STARTLED weeks ago when the voters of France descended onto Paris streets wearing government-mandated yellow vests in a massive protest against the French government’s numerous carbon taxes enacted (supposedly) to “fight” manmade global warming. The yellow vest protests brought the French government to its knees. French president Macron was forced to rescind some (but not all) of his “climate change” impositions. Worldwide, the promoters of apocalyptic-manmade-global-warming-by-CO2 hysteria have identified their greatest enemy: voters. Promoters of the hysteria are now rethinking about how to impose their will upon others. In Australia, the central planners have enacted one “climate” tax and regulation after another. According to Joanne Nova, Australia Wins The Global Patsy Award for 2019. Australia is doing more, paying more, suffering more and yet will make almost no difference to the global emissions tally in anything other than a purely symbolic impress-your-dinner–guests kind of way. Australian energy prices have spiked along with its carbon taxes and regulations. Consequently, at least three recent Australian prime ministers have been removed by popular outrage in recent years. Expect further uprisings in the near future.